Keith White had a good game against Tipperary. 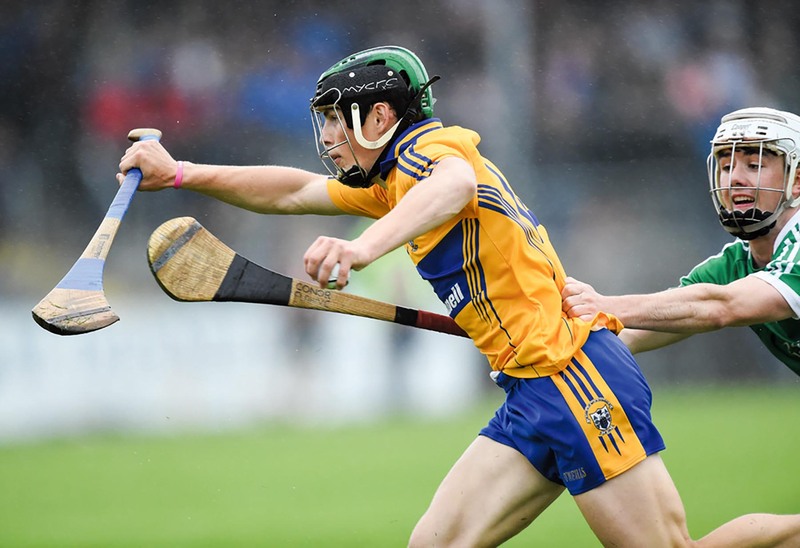 CLARE’S dreams of a Munster Minor Hurling Championship title are over for another year after they went down to physically stronger Tipperary side at Cusack Park on Wednesday evening. Their two goals may only have come in the closing minutes, but Tipperary deserved their victory at the end of a rather disappointing contest. The win has earned Tipperary a semi-final date with Cork but a huge improvement will be required if they are to have a chance of progressing to the final. 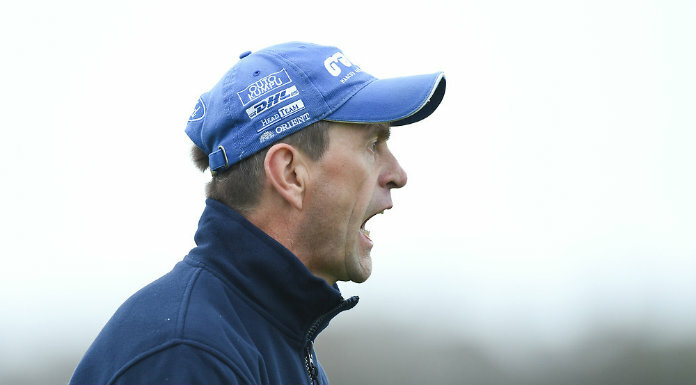 Clare made one change in personnel and several positional switches from the side that lost out to Limerick in the opening round three weeks ago. Ross Hayes moved to wing-back to the exclusion of Patrick Mulready and Aidan Kennedy came in from the start at corner-forward, after he had impressed when introduced in that game. Clare had a new midfield pairing of Clonlara clubmates, Kieran Galvin and David Fitzgerald, while Conor Tierney moved from midfield to lead the attack. The first half was particularly poor, especially from a Clare perspective, as they struggled to make any impression. In a 10 minute spell at the start of the second quarter, the visitors hit seven unanswered points to take a commanding lead and when the half-time whistle sounded that was the margin separating the sides, with the score at 0-12 to 0-5. 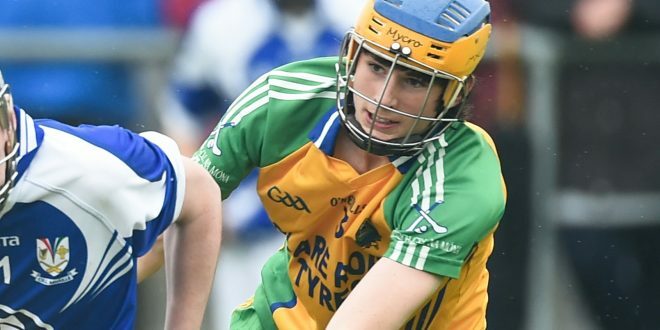 The standard of hurling from both sides in the opening quarter was particularly disappointing with players guilty of poor striking and misdirected deliveries in all sections of the field. Indeed, Clare could have found themselves well behind but for the sharpness of their full-back trio of Cian McInerney, Damian O’Loughlin and Keith White. There was much more urgency about Clare after the break and they hit four points in succession to close the gap to four with 20 minutes remaining. With the light fading rapidly, the home side had the lead down to three with as many minutes remaining. Tipperary pulled an extra player back into defence and Clare simply could not find a way through. With players pushing forward in search of the goal that would force extra time, the home side left gaps at the back, which the winners exploited in the closing minutes. Killian Nugent came to Clare’s aid with a fine save from Rian Doody with two minutes to go, but the Premier outfit got through for a goal a minute later. Cian Darcy found the space and with only Nugent to beat, he blasted to the roof of the net. This crucial score came just as three minutes of additional time were signalled. In the third minute of additional time, Tipperary substitute, Dylan Walsh, with his first touch, scored their second goal to seal their passage to the semi-finals, which will take place at the end of June. Jerome Cahill excelled in defence for the winners, who also had good performances from Brian McGrath, Cian Darcy, Mark Kehoe and Ger Browne. For a disappointing Clare side, Killian Nugent, Cian McInerney, Damian O’Loughlin and Keith White did best. Tipperary: Ciaran Barrett; Cillian O’Dwyer, Michael Whelan, Gavin Dunne; Cian Flanagan, Brian McGrath, Jerome Cahill; Ger Browne (0-4), Paddy Cadell (0-1); Rian Doody, Cian Darcy (1-1), Mark Kehoe (0-4); Shane Neville (0-2), Jerry Kelly (0-1), Lyndon Fairbrother (0-2). Subs: Brian O’Meara for Cadell; Jake Morriss for Kelly; Dillon Quirke for Neville; Kieran Breen for Fairbrother; Dylan Walsh (1-0) for Doody. 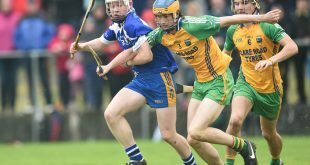 Clare: Killian Nugent (O’Callaghan’s Mills); Cian McInerney (Inagh-Kilnamona), Damian O’Loughlin (Corofin), Keith White (Inagh-Kilnamona); Tobias O’Meara (Killanena), Cathal Noonan (Killanena), Ross Hayes (Crusheen); Kieran Galvin (Clonlara, 0-1), David Fitzgerald (Clonlara, 0-1); Gary Cooney (O’Callaghan’s Mills), Conor Tierney (Doora-Barefield, 0-1), Sean Kennedy (Kilmaley, 0-1); Sean O’Loughlin (Kilmaley, 0-2, captain), Ian Murray (Bodyke, 0-5), Aidan Kennedy (Kilmaley). Subs: Sean Costelloe (Wolfe Tones) for Hayes; Tadhg Connellan (Éire Óg) for Tierney; Conor Lynch (Ballyea, 0-1) for Fitzgerald; Brian Conway (Wolfe Tones) for Galvin (inj).